Where Is Julie Speaking Next? Executive Leadership Support Forum: Toronto, Ontario, Canada, March 6-7, 2019.
Business Management Daily: Advanced Admin Skills Workshop: Developing a Strong Administrative Partnership with your Executive, Wednesday, March 20, 2019, 1 p.m. EDT, 12 p.m. CDT, 10 a.m. PDT. Business Management Daily: Developing an Effective Procedures Manual, Friday, April 5, 2019, 1 p.m. EDT, 12 p.m. CDT, 10 a.m. PDT. 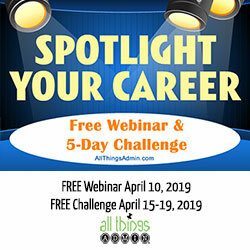 Business Management Daily: The Organized Office: How to Create Effective Systems that Actually Work, Friday, May 10, 2019, 1 p.m. EDT, 12 p.m. CDT, 10 a.m. PDT. 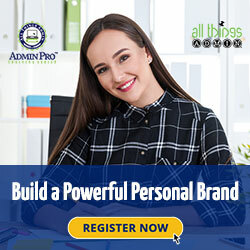 Admin Pro Forum: Orlando, Florida, May 29 – 31, 2019. Executive Leadership Support Forum: New York City, June 19-20, 2019.
Business Management Daily: The Innovative Admin, Friday, July 19, 2019, 1 p.m. EDT, 12 p.m. CDT, 10 a.m. PDT. Business Management Daily: Creating an Effective Procedures Manual, Wednesday, August 14, 2019, 1 p.m. EDT, 12 p.m. CDT, 10 a.m. PDT. Business Management Daily: Advanced Admin Skills Workshop: Developing a Strong Administrative Partnership with your Executive, Friday, August 30, 2019, 1 p.m. EDT, 12 p.m. CDT, 10 a.m. PDT. Business Management Daily: The Organized Office: How to Create Effective Systems that Actually Work, Wednesday, September 25, 2019, 1 p.m. EDT, 12 p.m. CDT, 10 a.m. PDT. Business Management Daily: Creating an Effective Procedures Manual, Wednesday, December 4, 2019, 1 p.m. EST, 12 p.m. CST, 10 a.m. PST.